Śrī Stuti is a devotional text dedicated to Śrī, our Divine Mother and consort of Lord Nārāyaṇa, also known as Lakshmi Devi or in South-Indian tradition of Śrī Vaiṣṇavism often known as Perundevi Thayar. It is believed that reading and studying Śrī Stuti can bestow many kinds of riches to devotees – both spiritual and material. It is also filled with profound philosophical and devotional meaning. While there have been several texts known as Śrī Stuti, this is the one handed down through Swami Vedanta Deśikan, one of the most revered Gurus of Śrī Vaiṣṇava paramparā of 13th century. The story tells that once a very poor Brahmachari visited Āchārya Vedanta Deśikan and told about his not being successful in gaining the hand of a suitable bride because of his poverty. 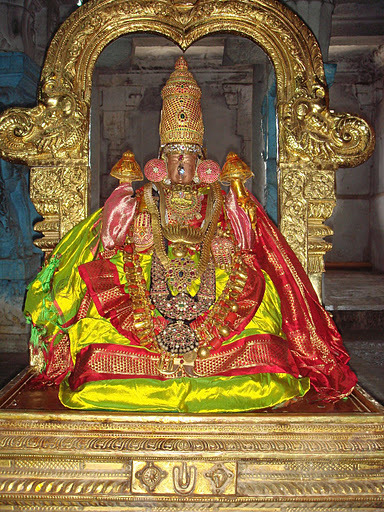 The most compassionate Vedānta Āchārya took him to the mūrti of Perundevi Thayar, the divine consort of Lord Varadarāja and composed a Stuti on this Arcā Mūrti of Śrī Devi to receive Her blessings for the Brahmachari. At the conclusion of the recitation of this new Stuti for Śrī Devi a rain of gold coins poured in front of Swāmi Deśikan. The Brahmachari collected the coins, offered his Vandanams to Swāmi Deśikan and Perundevi Thayar and found a suitable bride to enter Gṛihastha Āśrama. The full text consisting of 25 verses of Śrī Stuti with translation in English you can read below on this page. Adiyēn performs Prapatti to Mahā Lakshmi (the refuge for all the beings of the world) as one, who has no other refuge. She is the Mistress of the widely spread and limitless Aiśvaryam (wealth). She is the Maṅgalam (Auspiciousness) of all Maṅgala vastu and Tattvas. She is the embodiment of all Maṅgalam. She adorns the chest of Her Lord with Her divine and incomparable Jyotiḥ. She is the Vara Lakshmi (boon-granting Lakshmi) for all, who are eager to gain Her anugrahas both in this and the other world. The places of Your Avatāra are the Milky Ocean and the Yāga Sālā of Janaka Rishi. Your places of residences are the lotus ponds and Your Lord's chest. All the worlds (both Nitya Vibhūti and Līlā Vibhūti) are Your wealth. when it is so, how can men of limited intellect attempt to praise Your glories adequately. It is of course impossible. the whole world celebrates them for that good deed. for their good intention and execution of the deed of praising You. Adiyēn has no refuge except You. Adiyēn is eager to eulogize You of such stupendous glories. Adiyēn has no doubt about my efforts becoming fruitful. Adiyēn will attain the glory of being recognized by the people of this world for my Stuti. There is no surprise here. Who indeed will not gain all Maṅgalam, when he or she holds on to Your sacred feet and eulogize you. Therefore, adiyēn is also going to be blessed by You. Even if adiyēn does not have the Jñānam and śakti to praise You in a befitting manner, the very desire to praise You will give me the power to complete this effort and shower adiyēn with all Maṅgalam. (1) He has the sentient and the insentient as His Śarīra and stays inside them as their Antarātmā (indweller = Antaryāmī Brahmā). (2) His sankalpa śakti is behind His acts of creation, protection and dissolution of the Universe, which are just līlās for Him. (3) He stays as the most auspicious One and confers auspiciousness on all the auspicious Vastu. They become auspicious because of His Maṅgala Svarūpam. (4) The Yogis control their senses through His anugraha (practise of Aṣṭāṅga Yoga) and are blessed to visualize His divya Maṅgala Vigraha inside their heart lotuses. (5) He stays as Paripūrṇa Nambi everywhere and everything through His unique Svarūpam (inherent nature) and matchless kalyāṇa guṇas. Oh Mother Mahā Lakshmi! You stay on the chest of this tejomayaṃ Mūrti without ever leaving that place of residence of Yours. Not for a fraction of a second do you stay away from that cherished home of Yours. You confer on Him the name of Śrīnivāsa through Your residence. He welcomes the contact of the red dye adorning Your sacred feet as His defining mark. That red dye enhances His natural beauty further. As a defining sign (lakṣaṇa), that red dye associated with Your Thiruvadi becomes the reason for all of His unique vibhavaḥ . The Upanishads take their wisdom from that lakṣaṇa and eulogize Him as the Supreme Being. You are thus the root cause behind all the glories of Your Lord. Oh Śrī Devi! That is Your glory! Oh Periya Piratti! You and Your Lord are always together as a matchless inseparable pair. In this state of union of Yours, the love for each other does not diminish even an iota at any time. You as a pair are eternal in existence. Either of You do not part with the other. There are no limits to each of Your kalyāṇa guṇas. When introducing You both as a pair, we have to introduce each of You in relation to the other. For instance, Your Lord is introduced as “Śrīyaḥ Pati” and You are introduced as “Viṣṇu Patni”. One has to be referred to with saṁbandha to the other. There are three preferred places for You both for play and to rest in “Nidrā Yoga”. These are; (1) at the bed of Ādi Śeṣa (2) on the heart lotuses of pure minded Yogis meditating on You both always and (3) On the top of Vedāntas (Upanishads), which always praise both of Your Vibhavas. Oh Mother! Both of You are the recipients of the mental oblations. Your greatness is inconceivable and it makes our hearts dance in ecstasy. Oh Mother! During the time of Prapatti, both Yourself and Your Consort become the targets for receiving the oblation (havis) of Jivātmā in the homam performed. This is so because of the homogeneous, Integrated and unified way in which both of You stand as One (yEka sEshithvam) to receive such offerings. Our minds dance with Joy over both of You and Your vaibhavams, which are beyond the power of the Vedas to describe adequately. Oh Mother of the Universe! Oh Mahā Lakshmi! In the ordinary Yajñas of the world, oblations (Ghee, Purodāsa et al) from the performer of the Yajñas are offered to the different devatās such as Agni, Indra, Sūrya and others in homa rūpam. The devatā for whom the Havis is intended is known as the UddhEsyan (One who is deemed fit to receive such Havis); That devatā receives the Havis and becomes delighted. That Havis making the devatā happy is known as śeṣa and the Devatā that received the Havis is described as Śeshi for that Havis. Both of You play a game of chess with primordial Nature (Mūla Prakriti) as the chess board marked by different coloured squares. Brahma, Iśvara and other devatās are the pawns to be moved; the Vedas and ever-liberated souls watch this game. this game is played by both of You on the chess board clearly marked by the three guṇas (hues) of Moola Prakriti (Sattva, Rajas and Tamas). The pawns used in this game are Brahma, Rudra and other Devas. Oh Periya Piratti! Yourself and Your Lord displaying great love for You engage in the playing of a game of Chess / Chathurangam to amuse yourselves. The couple will position the chessboard between themselves. There will be demarcations of squares with the colours of white and black as places to position and to move the pawns with the roll of the dice. As the couple joyously engage in this game, men and women friends will watch the progress of this game. Oh Śrī Devi! You and Your divine consort play a similar game to amuse Yourselves. This game of Yours is watched and cheered by the assembly of Nitya Sūrīs, Muktas (liberated souls) and Veda Maṭhas. white for Sattva, Red for Rajas and Black for Tamas. Brahma Loka, Śiva Loka, Indra Loka (Svarga) are the places for the rolling of the dice. Brahma, Śiva, Indra are the pawns used in this game. Both of You roll the dice of their Karmas and move the above devas in the appropriate squares. In other words, Both of You amuse Yourselves by assigning Brahma, Śiva, Indra Devas to appropriate positions befitting their karmas in the Prakriti Maṇḍala having the three guṇas as their defining features. Both of You enjoy the joy arising from your play. These acts of Yours are according to the dictates of the Vedas. Both of You make these moves with a unified mind set (i-e) without any discord. The Nityās (eternally liberated Souls) and Muktas (liberated Jīvas) witness this game. You are the Empress of the World. One who utters Your names such as Lakshmi, Padmā, Jaladhi-tanayaa (daughter of the Ocean), Viṣṇu Patnī and Indhiraa, escape the cycle of births and deaths, caused by sins. Lakshmi, Padmā, Kṣīra-Sāgara Saṁbhava, Viṣṇu Patnī, Indhiraa and other names of Yours are gifts to us from the Vedas (Śrutis). Those who repeat these sacred names of Yours will not be caught up in the wheel of Samsāra moved around by the mighty wind of Sins. They wont get sucked into this harrowing wheel of births and deaths driven by the mighty winds of Samsāra. Oh Mahā Devī! Varadarāja Priyā! As the Lord's consort, you obey His commands. The Vedas declare that You are the Empress to the prapañca constituted by the chetanās and achetanās just as Your Lord is the Emperor for this prapañca. You have the celebrated names of “Lakshmi, Padma, Jaladhi tanayA, Vishnu Patnī and Indirā etc.”. Vedas use these sacred names as their base for comprehending Your glories. Therefore, these names are like capital (Mūla) dhāna for them. When one recites them as Japam, their sins are driven away and that leads to the birth of desire in Moksha. Next, they perform Prapatti and gain Moksha Siddhi. Until reciting Your sacred names, the chetanās were suffering in the whirlwind of Samsāra and their sins drove them to be born in different yoni. They suffered untold miseries as a result of this Samsāric cycle. The repetition (aavrutthi) of Your sacred names removes the Moksha VirOdhi and permits them to practise Prapatti to gain Moksha (na PunarAvrutthi: = not returning to the Samsāric world). This śloka is recited to gain Kīrti in this world & to thrive. Some speak of You alone as the Supreme Power, while some others speak of Your beloved exclusively as the Supreme. But our firm conviction is that You the couple, constitute the Godhead. Bhagavatī! Some say that You are the Supreme (Pradhāna). Others say Your Lord is the Pradhāna. Let these people with such diametrically opposite views quarrel like those who climb and fall. Let these little men, who quarrel among themselves after they arrive at an auspicious matter, do what they please! Indeed, Your Lord engages in the sport of Creation of the Universe etc. for Your delight. When He does all these for Your pleasure, both of You residing at the centre of Śrutis as the Divine Couple, are our Para Devatā. Oh Mahā Devi! There are many mutts and they have different views about Your Tattva. Some say that You are the Empress of this universe. Using this view as their central belief, they interpret this view in different ways. One group states that You and Nārāyaṇa are only one Ātmā but have two separate bodies. Another group believes that Emperumāṉ is called as Lakshmi and there is no separate form for Lakshmi. Yet another group advocates that Nārāyaṇa creates You for enjoying pleasure just as He took on Mohinī Rūpa during the churning for Amritā to bewitch the Asuras. Few others say that Nārāyaṇa has taken the female form and has the name of Lakshmi to unite with Her permanently. A select few believe that You are the Supreme most being over and above the three tattvas of Chetanā, Achetanā and Iśvara. Thus all of these groups accept You, Bhagavatī, as Sarveśvarī and yet argue with each other along the above lines. Opposing this view that Lakshmi is Sarveśvarī, a group denies Your Sarveśvara-tvam and insist that Nārāyaṇa is the Lord of the entire universe (Sarveśvara) and that You (Lakshmi) has no claim to be called Īśvarī. They claim that you are a Viśeṣa Jīvan. These two groups that insist and reject Īśvara-tvam for Lakshmi argue vehemently for their points of view and become exhausted. These people declare that their views are backed by Śāstras and are unable to establish their points of views (i-e) they come forward to accept that Lakshmi is a separate Tattva and accept Her Vibhava but they fall apart by not accepting the Īśvara-tvam (nature of Being Īśvarī) of Lakshmi. Oh Devi with all auspicious attributes! Our Siddhāṅta is quite different. We believe that Your Lord engages in acts such as Creation of the beings of the world for Your pleasure (amusement). The Vedas appear to be talking about Him alone, when looked superficially. If one studies the Vedas deeply, it becomes clear that the inner meaning of the Vedas is about revering You both as equal. Vedas have also explicitly stated the above views. Therefore, We consider Both of You as Para Devatā. During the performance of Prapatti, One has to accept both of You as Upāya (means) for the offering of the Ātmā. In some Yajñas, Śāstras point out that one has to combine two devatās into One and offer the Havis to that united Devatā. Therefore, One has to have BOTH OF YOU as the target to offer the Ātmā as the Havis and THUS conclude the Prapatti Yajña successfully. As a fruit of that offering, the Mukta Jīvan should perform Nitya Kaiṁkaryam to BOTH OF YOU at Your Supreme abode. Both of You together shine as upāya and phalam. You are One with Lord Viṣṇu in thought and action .You follow Him in all His manifestations assuming identical forms. This is like sweetness that is inseparably present in the waves of the milky ocean. The knowledgeable ones describe You as the dearest friend and co-worker of Emperumāṉ, who has taken a vow to banish the sorrows of those buffeted by the Samsāric sorrows. It is because of this assistance to the Lord, You take an appropriate form and accompany Your Lord in every one of His Avatars. In this matter, You are like the waves of the Milky Ocean, which retain their sweetness independent of the distance they travel to reach the shore. Oh Mahā Devi! Your Lord has taken a vow (Vrata dīkṣā), (i-e)., to quench the sorrow of anyone, who experiences the Samsāric sorrows. For Him, this act is like a Yāga, where a dīkṣā is taken. It is required that one who performs any Yajña has to have his wife (Saha Dharmachāriṇī) next to him during the performance of that Yajña. As the dearest consort of Your Lord and as One, who has taken the Sankalpa with Him to remove the sorrows of the Chetanās, You contribute immensely to the successful completion of this Yajña. If You were not next to Him, Your Lord could not perform this Yajña. Vedas reveal this tattva. Your Lord takes on the Avatars of Rāma and Krishna et al. At all those times, You accompany Your Lord as Sītā, Rukmiṇī et al . You assist Your Lord to perform His duties of protection (dharma samrakshaNam). You never ever leave His side. The waves of the Milky Ocean travel a long distance to the shore, where Devas stay and pray. Independent of the huge distance these waves travel, the sweetness associated with those waves does not leave them and is always present. Similarly, When Your Lord leaves the distant Śrī Vaikuṇṭha to descend to this Karma Bhūmi to carry out His missions of any particular Avatāra, You take on an appropriate Avatāra and assist Him with an identical mind set. The sweetness will not stand disassociated from the Milky Ocean under any circumstance. Your slender form bright like molten gold shines to advantage in association with Lord Hari, the Emerald. Your manifestations appear and disappear according to Your will, like waves of Your primordial form, which is like an ocean of Bliss. Your sacred body has a slender waist and full breasts that make You slightly bent. Your body hue is like freshly molten gold and that compliments the emerald green lustre of Your Lord. That Supreme Vigraha of Yours is the source for the appearance and disappearance of all Your incarnations driven by Your desire (icchā siddha Avatars); that phenomenon reminds adiyēn of the beauty of the waves of the Ocean that form and disappear in an orderly manner from the ocean of bliss, Your primordial form. Oh Mahā Devi! The divine body that Your Lord has is known as Para Rūpa. That sacred body is known as the source of all of His Avatāra Thirumeni as Rāma and Krishna. That Para Rūpa is thus the primordial source for His other incarnations. In a similar vein, You have also a unique Para rūpam. That rūpam has the radiance of the molten gold. Your waist in that rūpam is like a slender creeper. Your whole body is slightly bent in that Para rūpam from the weight of your heavy breasts. Since Your Avatāra Thirumeni (sacred forms) arise from this para Rūpam, latter is the primordial source for forms taken during Your different incarnations to accompany Your Lord at the time of His various Avatars. Because of Your presence with the golden hue on the chest of Your Lord having the hue of the dark green Emerald gem, His sacred body (Thirumeni) attains a special kind of beauty. Your Thirumeni is of the form of Bliss. One can indeed visualize it as an ocean of Bliss. From the speed of Your Sankalpa, from time to time, Your divine Avatāra forms arise from that ocean of Bliss. Those Avatāra Thirumeni complete the tasks of the individual Avatāras and disappear into the Para Rūpam again. When one reflects on this phenomenon, one is reminded of a powerful wind that causes the appearance and disappearance of many waves from the ocean. Your Para rūpam is that ocean (of Bliss). Your Sankalpa is that powerful wind. Your Avatāra Thirumeni are indeed the waves that form and disappear. Saraswatī, Pārvatī and Śachī are but modifications of minute particles of Your own graceful will. The Aiśvaryam of knowledge (Vidyā=Kalvi) that is spread all around the world is under the influence of Saraswatī Devi, the consort of Brahma Deva; Lord Śiva, the husband of Pārvatī is subservient to Manmathā fearing the raising of the eye brows of His consort. Indra is wide awake with all his hundreds of eyes and is looking alertly for the hints form his Devi, SaamrAjya Lakshmi, Indrāṇī .Oh Mahā Lakshmi! The greatness (Mahimai) of Saraswatī, Pārvatī and Indra’s wife are nothing but specks form the power of Your anugraha saṁkalpa (Volition, Śakti). (1) Oh Mahā Lakshmi! The forms of all divine speech and the Aiśvaryam (Vibhūti:) resulting from them -- starting from Creation and extending all over the entire universe -- are under the control of Saraswatī Devi. (2) Oh Lady residing on the Lotus! Mahēśvara Rudra, who had the Meru mountain as His bow (Meru dhanvA) became the target and servant of Manmathā --- the one with the flowers as His arrows (Kusuma dhanusha:) --- as a result of the narrowing of the brows of Pārvatī, his wife. (3) Indra, the king of Devas (Mahendra:) is under the total control of Indrāṇī, His SaamrAjya Lakshmi and is focusing his hundreds of eyes (nayana sathakai:) on her always (nitya) as his single target. He is under her total influence. (4) For all these three consorts of exalted Devas (Saraswatī, Pārvatī and Indrāṇī), the glories of their power over their husbands arises from the infinitesimal portion of Your anugraha śakti. You are the reason behind their maturation and powers: “ThaasAm (For them) asou (this) pariNathi: (maturation and power) Thvadeeyai: (Your) bhAva lEsai: (from the littlest drops of Your sankalpam) bhavathy (becomes possible)”. This 13th śloka is recited to realize the happenings of Subha Kaaryams. This is a jewel of a śloka for Dhyānam about the Patt-Abhiṣeka of Mahā Lakshmi and Her ascent to the chest of the Lord after Her Svayamvara, where She chose the Lord as Her Divine Consort. Oh Mahā Lakshmi! As You emerged from the Milky Ocean, the primordial clouds Puṣkalā and Āvartanā showered flowers on You and the quarter elephants performed ablutions to You with golden pitchers. During that ancient time when Your Lord churned the Milky Ocean to bring out the nectar for the Devas, You arose from the flood of nectar and sat opposite Your Lord on the auspicious throne of a Lotus flower. The great clouds showered on You their downpour of flowers that made the world almost disappear. The activities of the clouds were followed by the elephants of the eight quarters that performed the sacred bath ceremony for Her as the Patta Mahishi for Your Lord with the waters held in golden vessels. The crowning ceremony as Sarva Lokeśwari was started by the Puśkalāvartakam clouds and concluded by the ashta dhig gajams to the accompaniment of the Veda Mantrams by the Maharishis assembled to enjoy the Mahotsavam. You are the sister of Nectar. The accursed gods resorted to You and regained their prosperity, which became permanent in all aspects. Oh Amrita Sahodhari! The best among the Devas along with their wives performed Saranagathi (Sanskrit for "surrender") to You, who is seated in the temple of the Lord's sacred chest. They resorted to You to for the removal of the curse of Sage Durvāsā that led to the loss of their wealth and positions. The result of their Saranagathi to You was their regaining of their former positions and Aiśvaryam. Your benevolent glances have blessed them with the restoration of rulership over the three universes and enjoyment of eternal wealth. wherever the beautiful glances of Mahā Lakshmi roam/rest, the flood of wealth showers in all those directions. The different kinds of wealth compete with each other to be there first. Oh Mother! All prosperities come and rushing, competing with each other as it were, in whichever direction your beautiful, nectarine, lotus-like glances turn. Oh Devi! Your glances are like the blossoming red lotus at dawn. They have vowed to protect the afflicted. They are like the blue clouds raining nectar. Whichever directions these auspicious glances fall, in all those directions, the flood of wealth competes with each other to be there first. The 16th śloka is recited for the growth of one's wealth. Some people need wealth to start Karma Yoga, which ultimately generates Bhakti towards You. For them, riches will stream out bounteously from the earth, from the house of Kubera, from the sky and from the Ocean. For those who wish to engage in Bhakti Yoga and want to follow aṅgas of ParamaikAnthy dharmas with the help of some wealth, the needed wealth will flow like flood from the earth as a treasure or from Kubera’s house or from the sky or from the ocean. Those who carry Your lotus feet in their hearts will virtually become emperors on this earth, with all prosperity at their command. Your sacred feet are wondrous head alankAram for the Vedas. Those who are blessed to hold those sacred feet in their heart for conferral of auspiciousness from early times will have the anugraha of rulership later over the universe with the symbols of royalty: white umbrella, the chāmara service and eulogies from the people. They will travel on the streets of their kingdom with a happy state of mind and with garlands of flowers around their shoulders. The key passage if this śloka is: “Vimala manasaḥ te dayām ālambante” Those with blemishless minds hold on to Your Dayā as their supporting staff in their life's journey. Men of pure mind will resort to Your grace, which alone can make them conquer the inner enemies, remove sins, ignorance and rebirth. Oh Lakshmi dear to our Father! Oh Mother of the Universe! Those with pure minds derive their strengths during their dEha yAthrAs by holding on to Your incomparable Dayā to (1) gain all auspiciousness (2) win over their ancient enemies of Kāma and Krodha (3) destroy their sins and (4) banishing their nescience. Your divine compassion is the boundary for all lines of chetanās from the blade of grass to the mighty Devas. The key passage of this śloka is: The Puṇya Salis protect the dam of Vaidika dharma with joy for pleasing You and Your Lord). Blessed are the persons, who serve You both, considering all material wealth equal to a blade of grass. They adopt the Vedic duties with no deviation and thus make you both happy. Oh Mother of the Universe! Those blessed ones, who wish to perform Kaiṁkaryas to You in unison with Your divine consort discard the material wealth of this world and engage in practise of Vaidika karmas for pleasing You both. They perform these Kaiṁkaryas with the resolution that they should not swerve away from these ancient commands of Your Lord ordained in His Bhāgavat Śāstras. The key passage if this śloka is: “Oh Śrī Devi! Those who have performed Saranagathi at Your sacred feet are the most fortunate. After the dissolution of their physical body, they reach Śrī Vaikuṇṭha of Your Lord). Oh Divine Mother! I wait upon Your lotus feet. They are the source of all welfare. The lucky ones, who just bend a little before these feet will live in the abode of Lord Vāsudeva, which is free from the impact of material nature. Oh the Devi of the Devadeva! Adiyēn prostrates before Your sacred feet which are worshipped by the Deva sthrees with garlands adorned on their heads; Your sacred feet are the growing ground for all types of wealth. Even those, who bend before them with nama ukthi become blessed ones and they reach Your Lord's Parama pādaṃ at the end of their lives on this earth. The key passage of this śloka is: “Oh Mother! With Your glances laden with the flow of life-giving nectar, please cool this defenceless one suffering from the scorching Samsaric tapas). Mother! Adiyēn is scorched by the summer (heat) of the three afflictions. Kindly cool me with Your gracious, benign, nectarine side glances. Oh My Mother! Adiyēn is suffering intensely from the fierce heat of the three afflictions and they are shrivelling me up. May Thou with Your side-glances -- that are like a flood of rejuvenating nectar-- cool me for a second. May those blemishless, cooling and dayā-laden glances of Yours restore me from my state of suffering from the Ādhyātmika, Ādhibhautika and Adhidaiva tapas! The key passage of this śloka is: “Oh Mother! What boon can I ask of You? None; Because Your cool and generous side glances confer on whoever it falls upon great rows of auspiciousness frequently). Adorable One! By Your grace, all my thoughts are only enhancing my loving devotion towards Lord Hari. You are always showering welfare on me. So, what more shall I ask for? Oh Bhagavatī! for us now, the welcome state of mind, wherein the fear about the samsāra has been destroyed through Your grace just as the dark night is chased away by the illumining rays of the rising Sun. Thanks to that grace of Yours, our thoughts have become auspicious and You have stimulated Bhakti towards Your Lord. Over and above these two blessings, what is there for me to ask of You? There is none that I could think of as additional boons to request. Out of Your abundant compassion and generosity, You are showering waves and waves of Maṅgalam on adiyēn. The key passage of this śloka is: “Oh Śrī Devi! adiyēn has become the target (key object) of both of Your Dayā”. Swami Deśikan exults here over the many anugrahas received from the Divya Dampatī. Divine Consort of the Lord! You are my Mother. Emperumāṉ Vāsudeva is my Father. I am the one, who was born as Your son as a result of both of Your Dayā. The key passage of this śloka is: “May this Vilakṣaṇa Mūrti of such noble attributes reside in my heart lotus and thus appear before me always!). May Goddess Lakshmi, the infinite source of all auspicious things, the ultimate abode of compassion, One who is glorified in the Vedas, the divine consort of Lord Viṣṇu, and the unique benefactor for all the worlds, always manifest before me! Śrī Devi is the undiminishing and eternal abode of all Maṅgalam. She is treasure house of Compassion (Karuṇā) and the boundary for the same. She is the Mandāra maalai for the head of Vedas known for their eternal fragrance. She is the precious wealth of the Lord, who destroyed the Āsura with the name of Madhu. She is the wish-granting Kāmadhenu responding to the prayers of the people of the world. May the Piratti of such unique attributes be present inside me always! The key passage if this śloka is: “Those who read this hymn on Periya Piratti with Her abode on the (golden) lotus flower will reach the boundaries of all Maṅgalam and become Emperors of this earth). Veṅkaṭēśa out of intense devotion composed this hymn on Mahā Lakshmi, which can remove the evils of the Kali age. Those who recite this hymn will become emperors and enjoy unlimited all round welfare. Arising from Veṅkaṭēśa Kavi filled with lofty Bhakti, this hymn with the power to dispel the ill effects of Kali yuga from people will confer the utmost among Maṅgalam and make them rulers of the earth ultimately.